According to Humbucker Music, next year will be the last year of production. Re: Express series being cancelled? That's what I've heard also. Humbucker has them on sale right now. Boogies never go on sale,so you know when they're clearing them out,that the end is near. rv7garage wrote: According to Humbucker Music, next year will be the last year of production. and why would you believe what any US guitar retail store said? Here it is. I've been trying it though all my cabs. So far I'm liking the Lopo 2-12 (looks like a recto cab) with an M65 Creamback and an M75-65 Scumback. It's been a fun day! End of an era! Wow. Well I'm glad I have two, I'll never part with either one! Confirmation : just went to Mesa's site : type in "Express 5:25+" in the search field (because there is no more direct link to it) will bring you to a page figuring the Express with the mention that it is no more in production. Well maybe the price point versus the competition in the market they were going after although to me it's a great price for a Mesa. The last band I was in about the third practice the other guitar player shows up with one saying he just loved the tone I was getting so much he had to get one. I am disappointed by Mesa cancelling the Express series. I own an Express Plus 5-50. I have played through an Express 5-25. I believe I have typical needs. 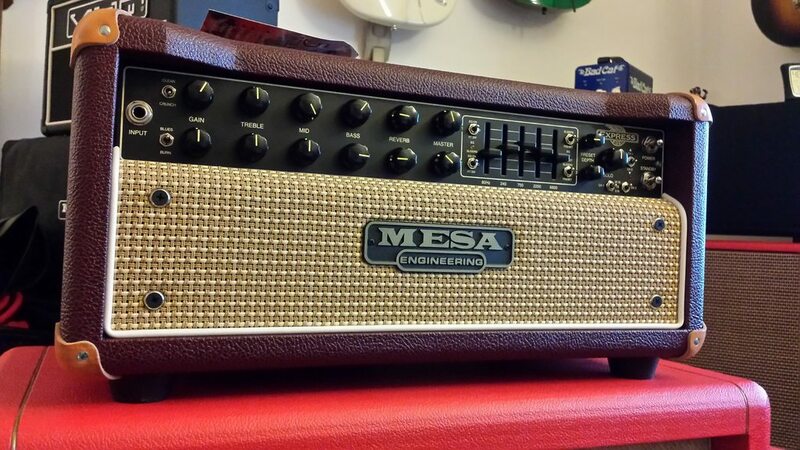 The Express Plus line fit those needs better than any other Mesa product. #1 need is to manage loudness. The Express Plus 5-watt setting was ideal for practice and 25-watt was ideal for rehearsal/gigging. (In hindsight, I wish I had bought the Express Plus 5-25 because 5-15-25 seems to be the ideal power scaling combination. I rarely go to 50 watts. #2 need is to manage appropriate gain. I am on the clean and blues settings on my Express Plus. Honestly, metal is not mainstream. #4 need is signal chain simplicity. That is why I picked a Mesa even if it is more expensive a traditional pedalboard + amp combination. I wanted to put my $$$ into the amp rather than a pedalboard. Needing a microphone rather than DI contributes to complexity. #5 need is weight reduction. The 5-50 is 55lbs. My two main rehearsal spaces have two flights of stairs and no elevator. This aspect makes me curse my Mesa. The only things that the Express Plus 5-50 missed on is weight and Cab Clone. The only thing that the Express Plus 5-25 would miss on is Cab Clone. Well, honestly, there is a brand-deficit using Mesa. People assume you are either a shredder or more-wealthy-than-talented (“PRS Syndrome”). Mark V: More expensive and even worse for my needs. #1: Manage loudness. Nope. 10/45/90 watts settings are all too loud for practice/mic-ed gig/rehearsal. Do the math for the wattage on top of a 99dB speaker. Total overkill. #2: Manage Gain. Maybe. However, the third channel has exclusively metal tone stacks. Every guitarist I follow is moving to Nashville. Not much metal in Nashville. #4: Signal Chain simplicity. Nope. No Cab Clone. Given the price, it should have this. Mark 5:35. More expensive for the [different but same number of] misses. #1. 25 watts work for rehearsal/gigging but 10 watts is too loud for practice. Still going to be over 103-105dB with the 99dB speaker. #3: Solo Button. Yes, it has an even better solution. #4: Signal Chain simplicity. Yes. Lonestar Special: So close but damn the ridiculous weight. It thankfully omits the unneeded the 5-band EQ that pops when engaged. #4: Signal Chain simplicity. Maybe. No Cab Clone. #5: Weight reduction. Nope. Even worse. 60lbs? For a 30 watt amp? Wha? The Express Series was ideal. As I said...disappointed. SFBay-James4 wrote: I am disappointed by Mesa cancelling the Express series. Nicely put! I love my Express 5:25+ but I have a Mark V25 as well for variety.